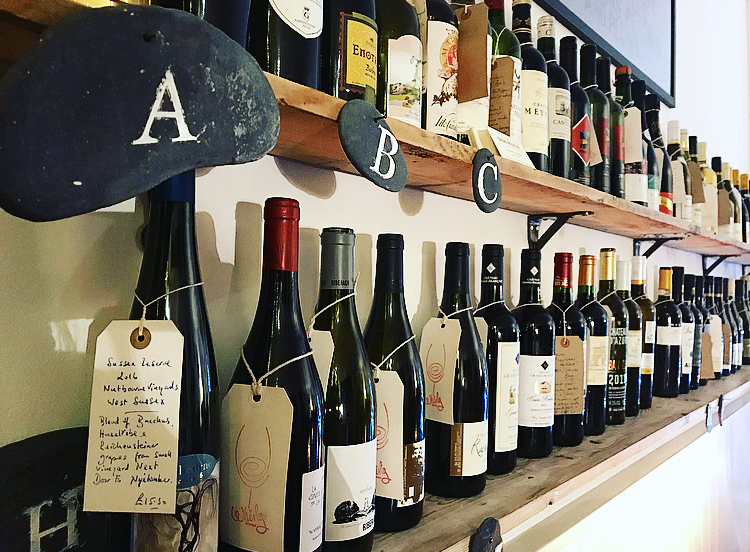 Last week I discovered Whirly Wines, a charming little wine shop in Balham, owned and ran by the friendly and charismatic Simon Charles Newson. Simon travels the nooks and crannies of the world to hand-source his wines and they are usually all made by small, boutique producers, so you’ll have a job finding them anywhere else in London. Simon’s passion for wine shines through with a contagious enthusiasm and whether you are a connoisseur or a novice, you’ll feel right at home in his shop-come-tasting room where you’re sure to discover some real gems. And what better time of year to discover those gems than Christmastime, when any occasion – be it a party, after work, or breakfast – is an occasion to drink wine. Simon has put together some mixed cases, carefully chosen to match classic Christmas fare, which also include some new wines that were imported this November from Manzone in Piedmont and Bonfanti in Lombardy. I personally really love the idea of a selection of wines that have been handpicked to pair with every stage of the festivities – each wine is going to feel like a gift to myself and will no doubt soften the blow of overdone turkey and cold gravy and warm us all up for an evening of Trivial Pursuit, reminiscing about Christmases past and holding dicey political discussions with the grandparents. Prosecco, Giol, NV “ Organic”: A Frizzante Prosecco. It’s important to have something sparkling on Christmas Day and this wine fits the bill. Well-made and classy, light and creamy. Lillypilly Sauvignon Blanc 2015: Old aged SB from Leeton, NSW, Australia. Savoury notes beginning to show through, yet still a wine with verve and energy. Villa Aganoor, Pinot Grigio 2016, Verona, Italy: Really exciting PG! Yes, I mean it, pear and apple and good acidity and depth. Velenosi, Montepulciano D’Abruzzo, 2017, Ascoli Piceno, Marche: New wine just arrived from Marche in November 2018. Malaville, Charmille, Vin de pay de L’Herault, 2015: A fabulous new wine just in from the Languedoc. Seriously one of my favourite wines imported in the last 10 years. Soft tannins, very elegant – a great combination of Syrah, Merlot and Cabernet. Moscato D’Asti 2016, DOCG: Light, delicate sparkling wine from Piedmont (Alba). It’s slightly sweet but in the most delicious way and very much worth trying out. Only 5% alc vol too, so perfect for an indulgent morning on Christmas Day as you start to prepare the lunch! Elderflower on the nose and palate. Pure joy. Manzone, Rossese Bianco, 2016, Monforte D’Alba, Barolo, Piedmont: Rare grape, sadly most of it ripped up over the last 30 years due to the rise in price and fortune of the Nebbiolo grape. 12 months in oak. Serious white that rates highly on Mr whirls radar in terms of top end white wines that can hold the oak and deliver a wine that is improved by this process. “Organic’ Gruner Veltliner, 2017, Mehofer, Wagram. Top wine just imported in November 2018. Gruner is Green. Not a green wine but close, young and vibrant, the perfect Christmas morning wine whilst preparing the lunch. 11.0 % alc vol. Apples and pears with a hint of spice. A pure organic delight. Stefano Lubiana, Merlot 2008, Granton, Tasmania: Aged 10 years now, and for 7 of these in Mr Whirly’s cellar. Good provenance. Decant and enjoy on Christmas Day with your beef, if that’s what you are having. Rich ripe plums, tobacco and a hint of field mushroom and forest floor. Dolcetto D’Alba, 2016, Manzone, Monforte D’Alba, (Barolo), Piedmont, Italy: Dolcetto takes a back step to Nebbiolo, rather like the Rossese Bianco, it’s also been close to extinction due to fashion. It will have its time again though, so lets hail this wine and grape and enjoy. Soft notes, well expressed and elegant. Will work well with goose, duck on the day. Venetica, Bonfanti, 2016, Lombardy, Italy: New in, 1st December 2018. One of the best northern Italian wines I have tasted, a deliciously soft blend of red grapes like Rondinello and Corvione, the same grapes as used in Amarone. Great wine with beef if that’s what you are eating over Christmas. Big and juicy yet pure and velvety. “Nutty 2014”, English Sparkling, Nutbourne Vineyards, West Sussex: Top sparkling from vineyard next door to Nyetimber – smaller and less commercial than them and not as pricey. Chardonnay and Pinot Noir. Classic Champagne grapes. Dry, crisp and clean. Small bubbles. A delight on christmas Day morning! ‘Organic’ Gruner Veltliner, 2017, Mehofer, Wagram. Top wine just imported in November 2018. Gruner is Green. Not a green wine but close, young and vibrant, the perfect Christmas morning wine whilst preparing the lunch. 11.0 % alc vol. Apples and pears with a hint of spice. A pure organic delight. Manzone, Rossese Bianco, 2016, Monforte D’Alba, Barolo, Piedmont: Rare grape, sadly most of it ripped up over the last 30 years due to the rise in price and fortune of the Nebbiolo grape. 12 months in oak. Serious white that rates highly on Mr Whirly’s radar in terms of top-end white wines that can hold the oak and deliver a wine that is improved by this process. Mehofer, “Organic” Roter Veltliner 2017, Mehofer,Wagram, Austria: Roter means red, Gruner is green. Richer and creamier than the Gruner, lovely with a soft goat’s cheese or white cheese like Camembert, Brie etc. Graziano Chenin Blanc 2011, Mendocino, California: Top end Chenin, not from the Loire, its home, but from cool climate Mendocino in Northern California. Vanilla and cream bounce out of the glass. This wine is drinking beautifully for a 7 year old wine from California and shows that wines of this age can be made to last and develop in the bottle over this sort of time. Ripasso, Bonfanti, 2012: Oh yes, now we are talking. Second cousin to Amarone but in no way overshadowed. “Ripasso” means “passed through again”. This wine goes through a second fermentation using the dried skins from the Amarone winemaking. Big, yet slick and fun! Beef and Yorkshire. Decant all day! Lillypilly Noble Blend 2006: Lillypilly Noble Blend 2006: Noble rot, blend of Semillon, Gewurtz, pineapple with orange blossom. Perfect Aussie sticky with a steamed ginger pudding or something similar. From Leeton NSW, near Griffith, the best “Botrytis” region of Oz. Velenosi, Visciole, NV, Marche, Italy: Old traditional way of making pudding wines in Marche, Italy. They pick cherries in late spring and make a syrup from the grapes then add grape juice from La Crima and Rosso Piceno grapes in September. Great freshness and acidity, you can really taste the red cherries. Perfect with Black Forest Gateau (the wine matches perfectly with chocolate). If you’re interested in purchasing any of Simon’s festive cases, you can order online or call or email Simon on 07821 968111 and simon@whirlywine.co.uk. Wishing you a VERY Merry (hic) Christmas!